During the dry season this track is classified as an easy track. during the wetter months it progresses to proably difficult/very difficult, so i thought I would leave it as a moderate. The mark is the start of the track and follow your nose until your feet get wet. There are multiple crossroads and they all lead somewhere and are another adventure all in there own. Word of warning though if you go for a swim at Stones crossing stay in the shallows around the rocks the area is well known for it's collection of swamp dogs, snapping handbags or commonly called crocs. 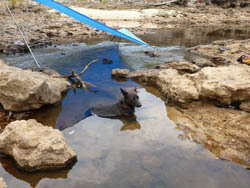 If you own dogs keep them close and the old rule if your dog stops barking, get out of the waterhole. commonly seen emu's and wallaby's on the drive in and the occasional dingo or goanna. A great place to go for the day or even better camp on the sandy creek bed under the branches of ancient flood beaten trees. if your camping take a chainsaw asnd get wood on the way in, all hard woods up here and good luck with an axe.